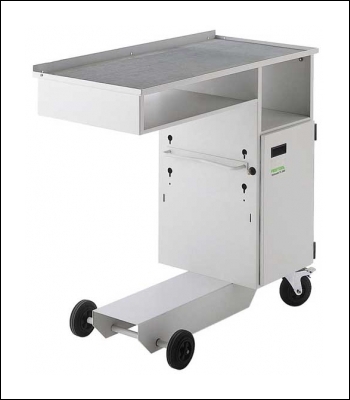 Extractor dock for safe integration of the mobile dust extractor. Perfect organisation, safe supply lines (hose holder). Equipment always within easy reach. Time-saving work organisation. Lockable cabinet for machine storage. Ergonomic layout of sanding workplaces. Mobile storage of all sanding equipment. Transports the equipment between different locations in the workplace, steering rollers provide maximum mobility.